After the death of Prophet Muhammad in 632 AD came to the forefront of the Muslim community first Abu Bakr (632-634) and later Umar (Omar) ibn Al-Khattab (634-644). Abu Bakr and Omar took the tittle of caliph or successors of the Prophet Muhammad and Abu Bakr became a first caliph of the Rashidun Caliphate (632-661). 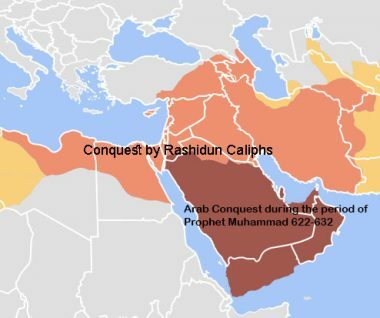 Rashidun Caliphate, “Rightly Guided” or “Perfect” Caliphate was the first caliphate founded by Muslim Arabs. Rashidun Caliphate lasted during the reign of the first four caliphs (Abu Bakr, Umar, Uthman ibn Affan known as Osman and Alī bin Abī Ṭālib), after the death of Prophet Muhammad. According to Sunni Muslims, the first four caliphs were called Rashidun (in translation “Rightly Guided” or “Perfect”) caliphs. On the other hand, from the point of view of Shia Muslims, Abu Bakr, Umar and Uthman were usurpers of the Arab Muslims community. So, Shia Muslims (in translation Shia as “followers” of Ali) only accepted Alī bin Abī Ṭālib as caliph. During the first two caliphs of Rashidun Caliphate, the unification of Arabia was completed and major victories were fought against Byzantine Empire, Sasanian Empire and against tribes in territory of Iran. However, during the period of Prophet Muhammad only the tribes of Hejaz (Al-Hijaz) and tribes of West Nejd accepted his authority. The greatest resistance to the unifying politics of the first two caliphs, came from inhabited peasant tribes, especially from the tribe Banu-hanifa. Banu-hanifa inhabited the land of al-Yamama (today’s central Arabia). In Banu-hanifa tribe specially role played their Prophet Musaylimah also known as Maslamah bin Ḥabīb. By breaking the resistance of the tribes at al-Yamama territory, troops from the Hejaz together with supporting of the Bedouins of North-eastern Arabia, broke in to the territory of todays Iraq and fought against Sasanian Empire. After a series of local successes and failures, in 637 at the battle of Qadisiyya, Arabians defeated and killed the Persian commander Rostam Farrokhzād. The Battle of Qadisiyya is one of the most striking battles because large Persian Empire loose power and until 641 Arabians took almost the whole territory of Sasanian Empire. The final stage of war between Arabian and Persian army took place in 642 at the Battle of Nahāvand where Sasanian king Yazdegerd III failed to defend his Empire and he fled to Isfahan (territory around 340 kilometers far from today’s Tehran). This battle was later described by Muslim writers as “Victory of Victories” because after the Battle of Nahāvand, Sassanid Empire “de facto” no longer existed. Simultaneously with the conquest of the Sassanid Empire, Muslim Arabians took victory on Syria and Palestine, territories controlled by Byzantine Empire. In May 636, the Byzantine Emperor Heraclius sent in Syria a huge army against Rashidun Caliphate. After a long maneuvers from the both sides the main battle started on 15th August 636 at the Yarmouk River Valley. The battle lasted five days until 20th August 636 and Arab army although smaller led by general Khalid ibn al-Walid, took the decisive victory against Byzantine troops. This victory allowed the Arabs to spread they authority over Syria and Egypt. In 642 Khalid ibn al-Walid conquered cities Malatya and Marash. Army of the Rashidun Caliphate crossed into Egypt in December 639 and by the end of 641 they took almost the whole Egypt. Due the continual rapid spreading of the Rashidun Caliphate, second caliph Umar (Omar) reorganized the government policy in order to maintain the entire territory of the Caliphate. 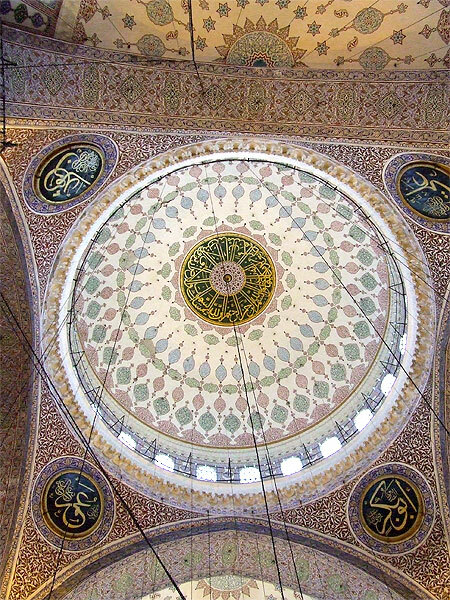 He was also formed a dīwān, high governmental body that performed tasks of the highest state significance. From the period of caliph Umar military was institutionally controlled and caliphate payed its soldiers for service. According to some sources Rashidun government after the conquest in the newly-established countries did not force non-Muslim population to change their religion into Islam. The Jews and the Christians continued to use their own laws in the Rashidun Caliphate. From the other hand Umar ordered that should be expelled Christian and Jewish communities of Najran and Khaybar into Syria and Iraq. Umar permitted to Jewish and Christian families to resettle in Jerusalem and ordered to Muslim community to treat Christian families well. Umar was killed with a knife in 642 and from the Shia point Umar was viewed very negatively because he was a usurper of Ali’s right to the Caliphate. The third caliph Osman (644-656), who belonged to the highly respected Quraysh (part of Umayyad tribe), set up everywhere in the provinces as governors his relatives. The omnipresence of the aristocrats from Mecca, who often resorted to violence and extortion, provoked protests and revolts. In 656 Arab Muslims from the conquered areas, supported by the population of Medina, killed Osman and proclaimed the new caliph Ali (656–661). Ali ibn Abi Talib was the cousin and the son-in-law of Prophet Muhammad. As a caliph Ali removed the provincial governors, who were mostly relatives of the Osman but the governor of Syria Muawiyah I, a relative of the murdered Osman, relying on the tribes of his province and began an war against Ali. This struggle was followed by the further development of controversy in the Arab society and served as one of the causes of the sect of Kharijites (also Khawarij and ash-Shurah). They were the proponents of military democracy, who declared the principle of supreme authority of the Muslim community. Starting from this principle, they only accepted when Muslim community having the authority to choose and replace caliphs. Ali moved capital city of Caliphate from Medina to Kufa in Iraq. Kharijites considered Ali and Muawiyah as usurpers they need to be removed by force. Ali achieved a victory over the sect kharijites but this sect managed to kill Ali in Kufa during the morning prayer in the mosque. Kharijites failed to assassinate Muawiyah and after the death of Ali he proclaimed himself as caliph in Jerusalem 661. Muawiyah was the first caliph of the Umayyad or Omayyad Caliphate. Ahmed Nazeer , Islam in Global History: From the Death of Prophet Muhammed to the First World War, Vol I, Canada 2000. Philip Hitti, History of the Arabs, Revised: 10th Edition, New York 2002.